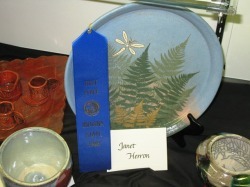 Janet Herron is a clay artist who utilizes wheel and handbuilding techniques to create functional pottery. Her work becomes unique through the process of altering, carving, and using different colored slips or clay bodies to finish each piece. She loves to incorporate shapes and designs from nature in her work. Janet began studying under Jolee Chartrand, owner of Monrovia Mudworks, in March 2003 and has enjoyed the experience so much that she now works part-time for Jolee helping to maintain the facility in exchange for studio time. She enjoys attending the NCECA national convention and in 2004 served as a volunteer at the convention in Indianapolis, Indiana. Janet is married with three daughters, two guinea pigs, and one dog which keep her busy when she is not up to her elbows in clay.